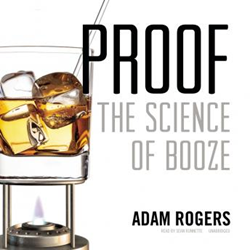 In a follow-up to Adams’ WIRED article “The Angel’s Share”, the Distillation chapter of Proof tells the story of how Sporometrics’ Dr. James Scott found himself studying mycology and delves deeper into the mystery of the whiskey fungus he investigated. Proof expands upon Adam Rogers’ 2011 WIRED magazine article “The Angel’s Share”; the story of Sporometrics’ Dr. James Scott’s discovery of not just a new species, but a completely new genus of fungi, identified on trees, street signs, and buildings surrounding whiskey warehouses in Lakeshore Ontario, then around distilleries across the globe. The unmasking of the whiskey fungus Baudoinia compniacensis is just one of dozens of tales Rogers tells as he uncovers the science of alcohol production, powered by physics, molecular biology, organic chemistry, and a bit of metallurgy-and our taste for the products is a melding of psychology and neurobiology.